Are you looking to achieve ASQ Certification and become an ASQ Certified Six Sigma professional? 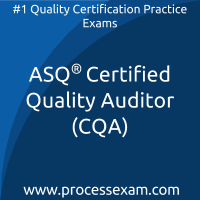 We have good news for you; we have a solution, which can help you clear the ASQ certification. We are here to assist you in achieving your goal by using our online certification practice exam platform. 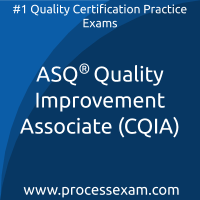 With tons of experience in the field of Process and Quality Improvement, our expert panel has designed these practice exams the same as real ASQ certification exams. 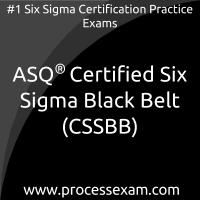 Our team of experts recommends you to use these online Six Sigma certification practice exams for your ASQ CSSBB or CSSGB or CSSYB Certification preparation. These practice exams will help you to validate your knowledge and identify the areas which need improvement, will make you familiar with ASQ certification exam environment, exam pattern and question format. 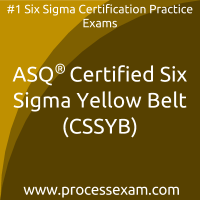 Understands Six Sigma philosophies and principles, including the supporting systems and tools. Demonstrate team leadership and understands all aspects of the DMAIC model in accordance with Six Sigma principles. At the project level, the black belts; Leads problem-solving projects. Trains and coaches project teams. Supports a Six Sigma Black Belt by analyzing and solving quality problems and is involved in quality-improvement projects. At the project level, the green belts; Assists with data collection and analysis for Black Belt projects. Leads Green Belt projects or teams. Has a small role, interest, or need to develop foundational knowledge of Six Sigma, whether as an entry-level employee or an executive champion. At the project level, the black belts; Participates as a project team member. Reviews process improvements that support the project. In Serbia, there are not many options for tutoring for ASQ certified yellow belt certification exam. But better than them, i received the help of processexam.com premium membership. The questions and simulated tests are awesome for preparation. 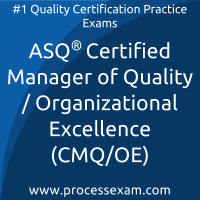 2 months unlimited access on processexam is more than enough to ace the CQE certification exam. It is a matter of pride for me that i received good marks in short period preparation! 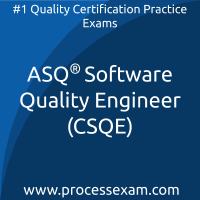 I practiced with premium ASQ CMQ/OE practice exam. I got more practical and even real time scenario based questions for the certification exam! My scores is a reflection of my right choice in processexam.com. 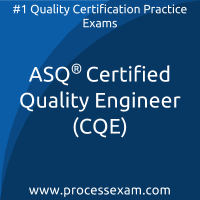 Thank you very much for providing me with the very helpful information on the preparation of ASQ Certified Quality Engineer (CQE) Exam. I have passed the exam in my first attempt. Sample questions was a great support during my studies. Thank you so much ProcessExam.com. I will easily climb the corporate ladder by securing scores in the recent certification exam.